After carrying out thorough market survey, Tesyker USB Powered Lights have solved the issue of huge electricity consumption which is widespread among 13 Colors Battery Lights, via updating power supply from AA battery to USB adding power plug. ● Extra-thin, flexible 4 wires twisted into 1 to strengthen the toughness, avoid it from tangling, but without affecting its modeling ability. 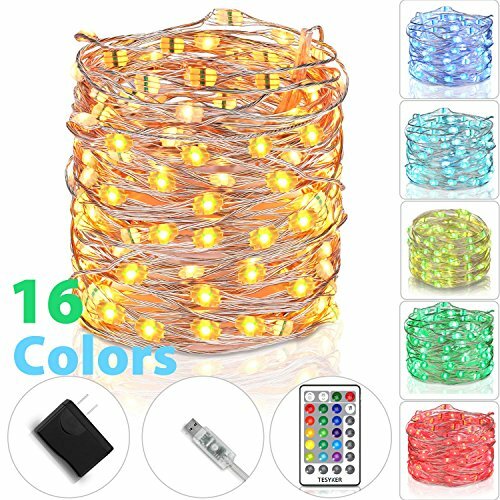 All in all, you can feel free to name it as the latest version or generation lll of Multicolor Fairy Lights, hope you enjoy our inspiration and creativity. CUSTOMIZED REMOTE: Handy 28-key remote enable you to customize lighting easily. Lighting up garden, bedroom, Christmas tree and patio with USB fairy lights. Make mundane fittings into glittering works. PLUG-IN LIGHTS: Easily plug in with USB plug or the included plug, release you from hassle battery replacement and enormous cost, minimize your cost to the least. VERSATILE USE: Thin, tough 4 strands twisted into 1 strand to avoid getting tangled and broken. Wrap around wreath, wheel or tree, and make them sparkle with your creativity. Fairy lights add decent ambience to party, festivities, costume and dating. STABLE COLORS: Color lights tech that determines different color options work on different voltages, to ensure lighting colors being adjusted accordingly and stay steady, VoltageStabilize applied to stabilize output voltage. QUALITY ENSURED: Do not hesitate to contact us right away if you are unsatisfied with USB Fairy Lights, our 24X7 worry-free customer service are always ready for you. If you have any questions about this product by tesyker, contact us by completing and submitting the form below. If you are looking for a specif part number, please include it with your message.